This is Joan Rigual in Casa Luthier, one of the most beautiful classical and flamenco guitar shops. Alicia Alcay and Joan Rigual started Casa Luthier in 1979. 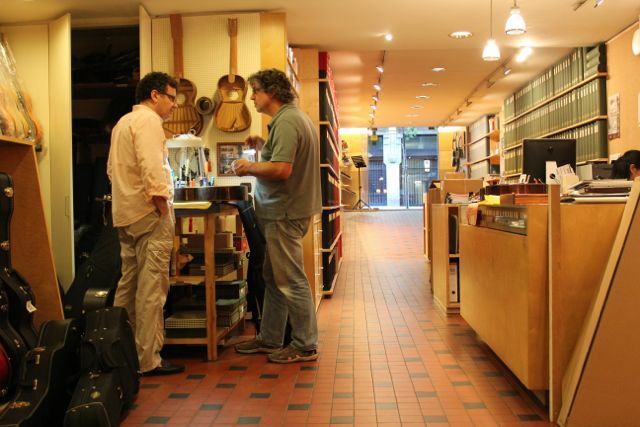 A tiny shop with student and concert guitars made by the best Spanish builders. I was very honored when, begin nineties, they started selling my guitars as well. In 1997 they moved the shop towards its current location, a large building in the same street. They celebrated the opening with a big party for all the builders they work with. Ten years later they celebrated their jubileum the same way. Alicia and her husband, the Icelandic guitarist Arnaldur Arnarson are still the owners of the shop. In the mean time Alicia started a music school as well as a dance school. Joan Rigual still manages the shop, together with his employees. Besides guitars you can also find a great collection of sheet music. Sometimes they organize concerts.